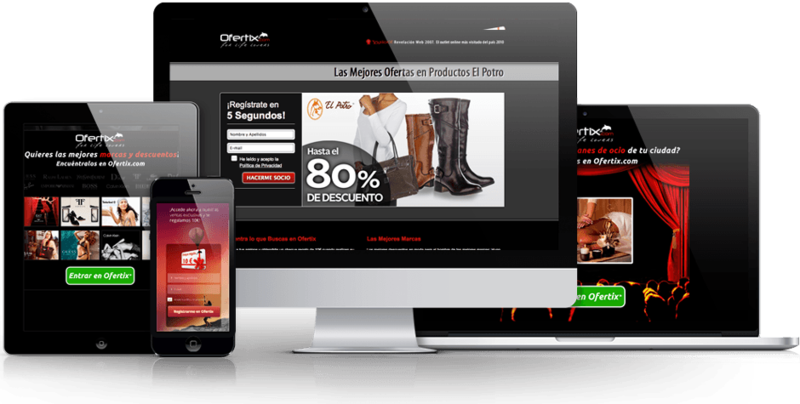 Ofertix is an online shopping club that organizes specific sales of top-brand products exclusively for their members with discounts up to 80% of their price in stores. Its online catalog has different sections – Fashion, Unique Products, Perfumes, Leisure and Getaways – and a physical retail store. In addition to the outlet format, Ofertix has diversified to include full-price products with Nice & Crazy. A year ago, Ofertix decided to consolidate its repositioning strategy, perfecting its online marketing actions through its 3 main channels: Facebook community, database, and resuming its television campaign integrated with online media. Ofertix and Cyberclick work jointly to publish daily offers in Facebook that keep updatings their online catalogue. They publish promotions of their offers according to the type of product, to which community they will be advertised, and the segmentation of the fans, among other things. Additionally, they create ads on Ofertix’s Facebook page. Weighing up these two actions, we see how in one year Ofertix has gained more than 100,000 new users on its Facebook community. When they started with this repositioning strategy, Ofertix had 70,000 fans, and as of today’s date they have more than 170.000. Therefore, these means have allowed Facebook to be one of the main traffic and sale sources of the company. The segmentation of those ads has made the Lifetime Value on Facebook to be 10% higher than those of other channels like Google and text ad campaigns. The online shopping club has carefully studied and perfected how to communicate each of their offers, followed by theme and seasonal campaigns. Community management both on their official Facebook page and on posts in other communities advertising their products is very effective. These good practices can be measured by the quality contents that are shared and user support. Additionally, the page includes applications to access their other social network accounts like Pinterest, Instagram, Foursquare, YouTube... It has its own section of news, events, highlights, and corporate blog. During this year, Ofertix’s database increased in more than de 500.000 users, and most important, its level of engagement is very high: over 15% of them have placed a first order. To achieve these results, we worked different collection channels: Sending email invitations to subscribe to Ofertix’s newsletter to be up-to-date on all their offers. Conducting a/b testing in order to optimize this campaign with incentives such as direct discounts on purchases or promotional codes. Scaling-up the SEM campaign (which currently has over 3 million words) and creating dynamic landing pages for each search. As a result, more than 500,000 monthly visits have been obtained from SEM. The television campaign was launched in November, supported by the display campaign in graphical and video format. This campaign has increased brand searches by more than 25% and at the same time increased the response on graphical formats by over 30%. Finally, we would like to point out that since mobile traffic exceeds the total by 30%, this year Ofertix and Cyberclick have paid detailed attention to the marketing strategy of this type of acquisition of new “mobile” users. The main formats that have helped this annual campaign to also be a success via mobile were by search traffic, social network traffic, and display campaigns on mobile sites and applications.